Huawei recently launched its P30 flagship smartphones, and MyBroadband covered the media event live from Paris. Getting around Paris can be a bit difficult at times, especially during peak traffic times where the cost and length of an Uber journey increases drastically. 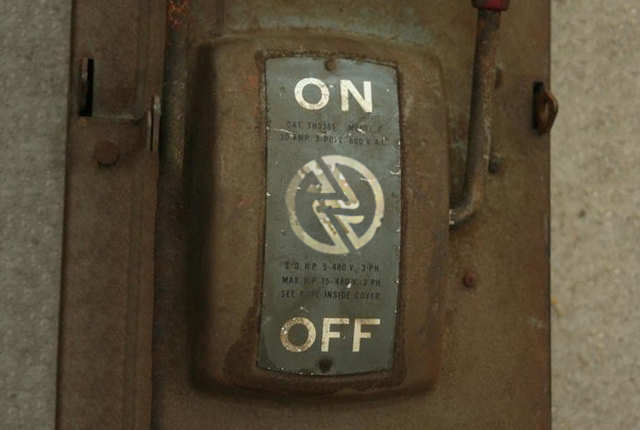 There is always the public train system, but this is not suitable for “sightseeing” travel around the city. I subsequently regressed to walking – until I saw a swarm of green scooters whizzing around. I had found Lime scooters in Paris. Lime is an electric scooter-sharing network where you can rent any connected scooter for a per-minute fee by scanning the ride’s QR code and locking it again when you are done – leaving the scooter parked for someone else to ride. Never one to pass on a chance to try new technology, I downloaded the Lime app for Android and set up my account to join in on the action. After downloading the app, it took only a few minutes to log in with my Facebook account and link a credit card. I then manually loaded my wallet with R200 to get started and turned off the Auto-Reload function, which would recharge the account if I ran out of funds during a ride. 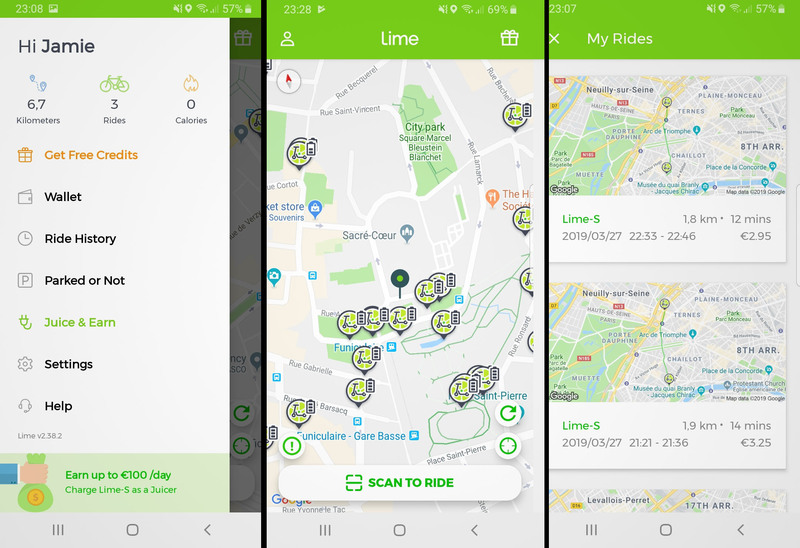 The app displays a map of your immediate surroundings along with the locations and remaining charge of any nearby Lime scooters. You can also view your previous rides and your overall statistics in your user profile. Beginning a ride is as simple as finding a parked Lime scooter, walking up to it, and scanning the QR code on its handlebars with your smartphone. You then push off to give yourself initial momentum and control the throttle via a thumb throttle with your right hand and the brake using a lever on the left handle. The scooters around Paris have an LED display which shows your speed and remaining battery charge, and they also have built-in LED headlights for safer navigation at night. Once you are finished with your ride, you are advised to park the scooter somewhere safe and tap the Lock and End Ride options. 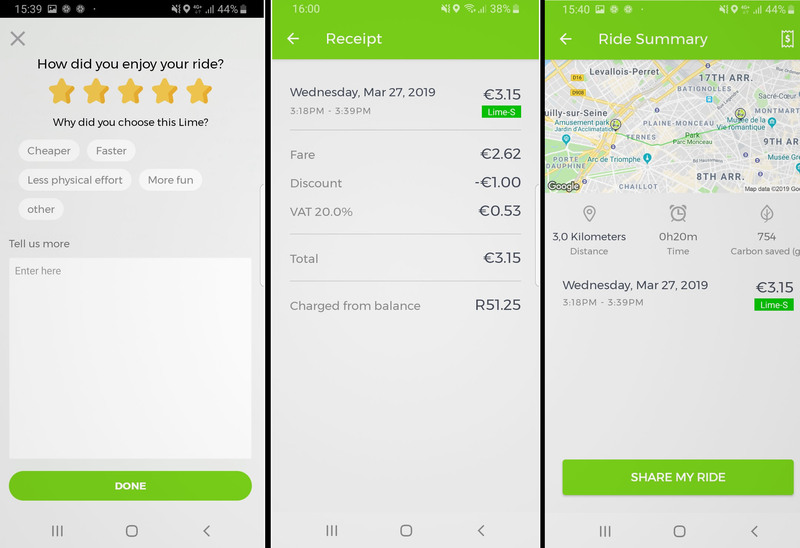 Lime charges riders in Paris a €1.00 flat fee for unlocking a Lime scooter and €0.15 for every minute thereafter. Once you are done with your ride, you will receive a short summary of your trip along with your receipt. I was quite apprehensive about joining the crazed city traffic at first, especially considering I hadn’t been on a scooter in years and drivers in France drive on the right side of the road, but the experience went far better than expected. My first ride was back to the hotel I was staying at, and I simply walked up to a vacant Lime scooter and scanned its QR code from the Lime app – unlocking it almost instantly. I mounted the scooter and checked my planned route one last time before setting off. The scooter is completely silent, but it can reach around 20km/h in the right conditions and it proved far easier to ride than I thought. When it comes to the route I had chosen, I found it far easier to forgo the crowded pavements and traffic-locked road lanes for the dedicated bike lanes, which are common across roads in Paris. This provided a modicum of safety while still allowing me to open up the throttle on the scooter and not worry too much about pedestrians meandering into my path. The surface of many roads in Paris are cobbled, which thankfully proved more of a discomfort than a hazard, and I gained confidence as I became used to the right-sided traffic flow and the number of other scooter riders around. It would have taken me an hour on foot or 28 minutes using the subway to get back to the hotel, but I made it back in a solid 20 minutes on the Lime scooter. Lime scooter parked on a street in Paris. This one was picked up by another rider after I was finished with it. Parking the scooter near a bike rack by my destination, I had barely dismounted before another Lime user approached and patiently waited for me to end my ride before he scanned the scooter himself and whirred away. 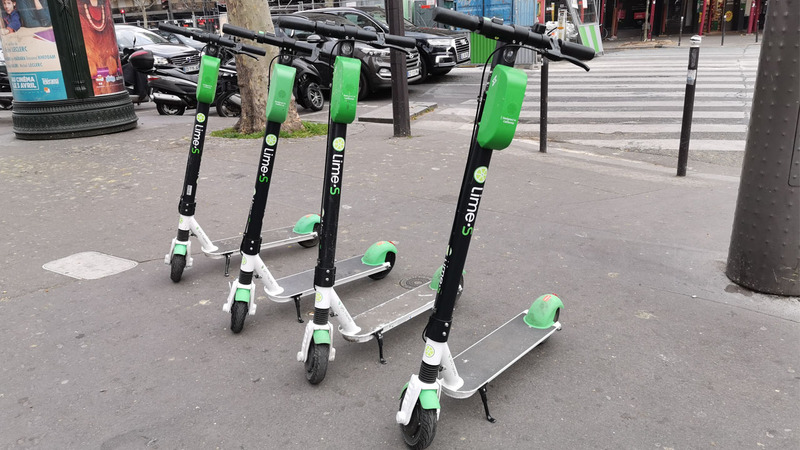 Lime scooters launched in Paris in 2018 and have already become a common sight on the city’s roads, with many commuters opting to use the electric scooters over the subway or bicycle renting services. The cost was more expensive than a metro ticket but far cheaper than an Uber Pool, with my first 20-minute trip back to the hotel only costing me around R50 – as I received my first unlock for free. 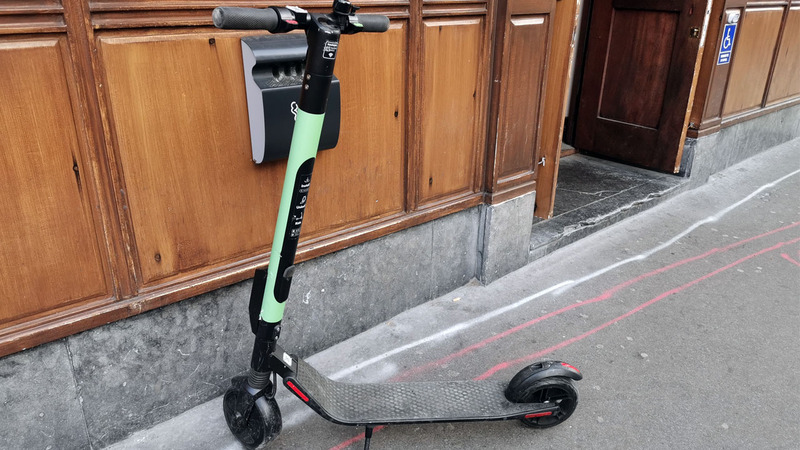 I used the electric scooter-sharing platform a few more times for short trips around the city and it proved a great way to explore Paris without the fatigue or slow pace of walking around. 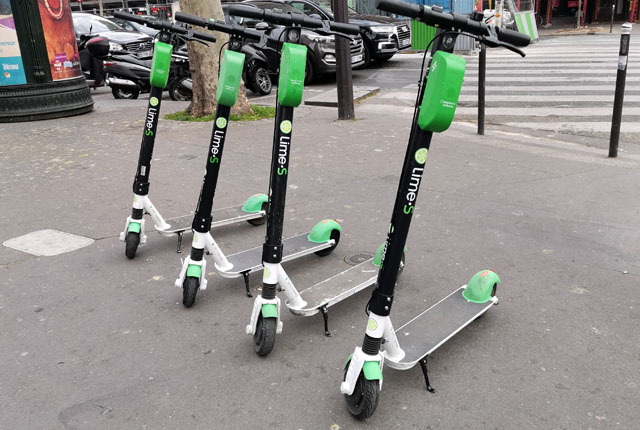 However, while these scooters are perfect for the grid-locked and electric vehicle-friendly environment of Paris, I struggled to see any use case for the Lime platform in South Africa. 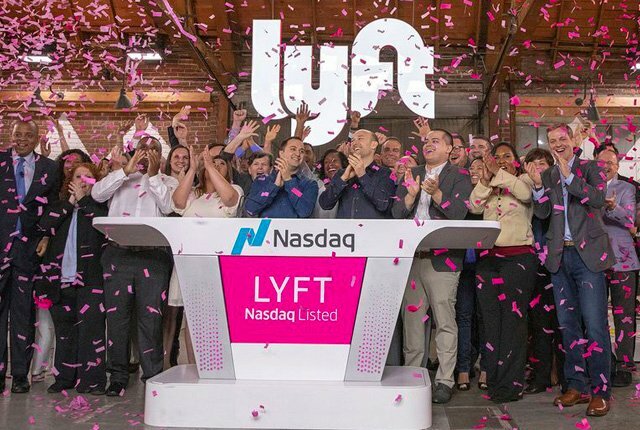 With the prevalence of crime, dangerous driving, and the lack of infrastructure for both bicycles and electric vehicles, it could easily prove too dangerous or difficult to properly launch a service like Lime locally. Lime scooters parked at an intersection.